Why is Philadelphia so Underrated? I fail to understand why forumers and people in general don't give Philadelphia the attention it truly deserves. It's CLEARLY the 2nd most urban place in America after New York and Center City is the most vibrant place in the country after Midtown Manhattan. Not to mention Philly has the largest collection of narrow streets, the most active bike culture, and the Mecca of American History. Philly deserves as much national attention as New York of DC and certainly more than SF, Chicago, LA, or Boston. Also, don't you agree that the Mummers Parade should replace the Rose Bowl for national broadcast and they should show Philly's 4th of July celebration instead of New York's? Or Thanksgiving parade, when Philly has the nation's oldest parade they decide to televise fecking New York. Philly is the real 2nd city of the U.S. It's more historically important than Chicago, San Francisco, or LA. And it's more urban than Boston or DC. Or how about having the 3rd largest museum district, theater 2nd only to Broadway, and a classical music scene that's beyond anything else in this country? Or the Made in America festival? It's only 3 years old and already draws bigger crowds than Chicago's Lollapalooza! + Philly is growing faster than any other city not in Sunbelt. In fact, only Dallas and Houston added more construction jobs last year. Philly's economy is pretty robust, and with Comcast the tech sector may surpass Silicon Valley. Center City is cleaner than most downtowns, New York included. Subject: Interesting article on banks moving jobs to lower cost cities. "Morgan Stanley will be straying ever further from its Wall Street roots in the coming months as it shifts more operations to lower cost cities like Mumbai and Budapest as it aims to slash costs. The investment bank on Tuesday announced an initiative to cut up to $1 billion by 2017 by using technology and outsourcing jobs now in its New York headquarters and other higher cost cities. However, it declined to give specific details about the number of jobs it would move to lower cost centres. "We have too many employees based in high-cost centres doing work that can sensibly be done in lower cost centres," (CEO James) Gorman said on a fourth-quarter analyst call with analysts. "Manila already one of the top BPO cities and Iam sure they will get more. " BGC has a HUGE expansion of office space underway, much of it is for BPO's, so they willl appreciate the business. And maybe if all those offices get filled then the huge increase in condos, like 20-30% in a year, will get absorbed soon enough the keep rents and prices from sliding lower. Most people including Colliers seem to think the absorbtion will happen. Philadelphia office rents might get a nice boost, since most of the high rises coming in are residential in Philly. Yes, I know about Manila being the world's leading BPO center. What this article is talking about is not more outsourcing, it is about actually putting thousands of Morgan Stanley, Goldman Sachs, etc... staff relocating to places like Glasgow and hopefully Philly and Manila. Philly has a big advantage in beings so close to NYC. A 60-90 minute trip from train station to train station. I wonder how close Morgan Stanley's office is to Penn Station? There's one right across the street from Penn Station, but most of their offices are a couple blocks away in Midtown. Wow, that's certainly very convenient. 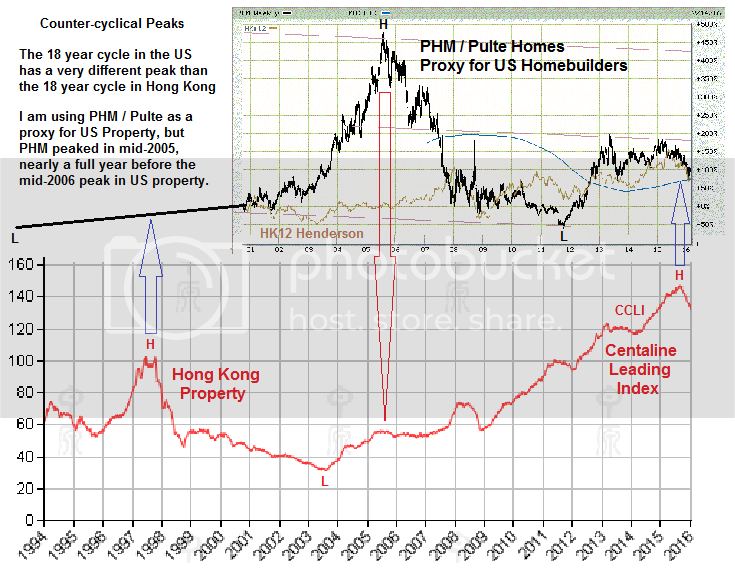 The Long term, Property Cycle in the USA is contra-cyclical to Asia. This is one of the reasons why I am investing in Philadelphia. 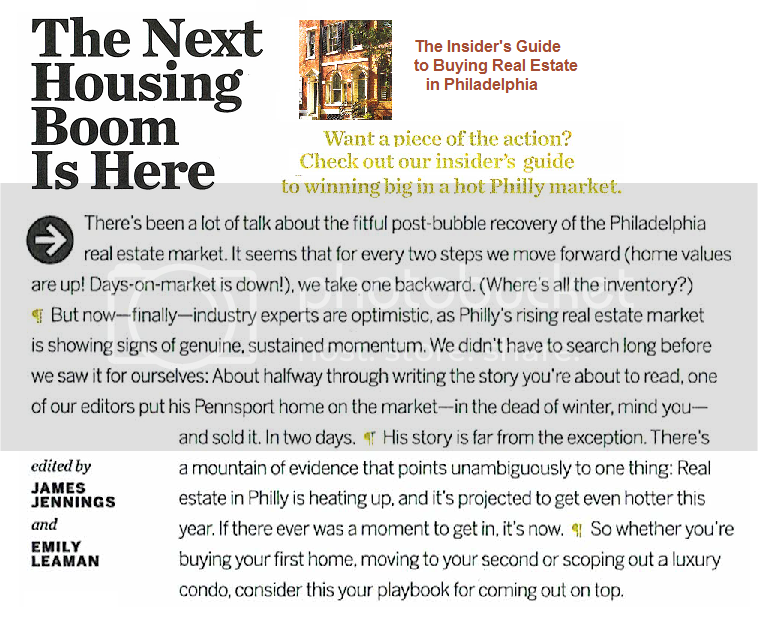 "Philly's rising real estate market is showing signs of genuine, sustained momentum"
+ With average 1 BR rentals at $1,200 per month, or more in the Central City, it is a really good time to shift to ownership. Interest rates are low too, at mid-three to mid-four percent. Consequently, lots of starter home neighborhoods are experiencing a housing boom. Home values were up 5.2% in South Philly, and 4.4% in Kensington, Port Richmond, and Fishtown - and they are expected to rise this year too. Rule-3 : Sell first, then Buy (then you can negotiate from strength); maybe sell and lease back for a period. The average time on market now is 65 days, with closings taking another 30-60 days. Rule-5 : Not all new construction is equal. Research track records of builders, and architects. Energy-efficiency is something to be aware of (LEED, or Energy-star certified), the lumber used, and type of roof material. Rule-4 : Careful! Many Condos limit renters - so be aware of renter ratio, some cap at 25%, price impact? Rule-7,8,9: Pets regulations vary. Condos can issue surprise assessments. Only 5 days to review docs? Rule-3 : Supply is super-limited (for larger flats, especially in Center City; buy 2 and combine them? This articles says a 30% drop in HK residential in 2016 is possible. The property slump in Hong Kong is showing very few signs of abating. 30% - 40% from the Peak (Sept. 2016) is possible. But I don't think it will all happen in 2016 . 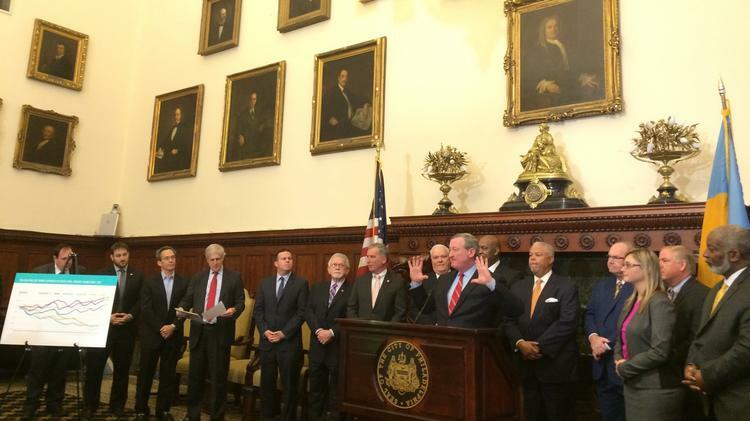 I think trading-the-Cycle will work better in an undervalued City like Philadelphia. Interview with Jimmy Ngai of Jubilee Capital of Hong Kong. We talk about property investment in Philadelphia. and it is guaranteed for 3 years - often with a BUYBACK OPTION. Philadelphia is the 4th most walkable major city in the USA, and has much lower prices, and higher yields than New York City, San Francisco, Chicago, or Boston . With job growth and new skyscrapers being built, is showing rapid gentrification. Philly not priced too high relative to SF and other places. To afford a home in Pittsburgh, you'll need to earn around $31,100 a year. San Francisco : $147,996 : --- $ 781,600 : 5.28 : $ 3,453/mo. Boston---------- : $ 83,151 : --- $ 393,600 : 4.74 : $ 1,940/mo. New York City-- : $ 86,770 : --- $ 384,600 : 4.43 : $ 2,025/mo. 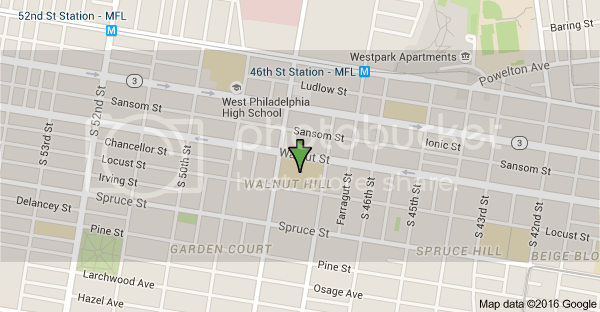 Philadelphia----: $ 51,622 : --- $ 213,700 : 4.14 : $ 1,205/mo. Baltimore------- : $ 52,865 : --- $ 233,500 : 4.42 : $ 1,234/mo. Washington---- : $ 78,626 : --- $ 371,600 : 4.73 : $ 1,835/mo. at a much higher price and pay a lower mortgage than the present rent. Feb 17, 2015 - Parsing a new study finds Philadelphia gentrification rate to be highest in the nation—by a lot. Anew quantitative analysis by Governing magazine attempts to measure the recent uptick. The study looked at low income census tracts in the nation’s 50 biggest cities since 1990, and found that, nationwide, the pace of gentrification of low income urban neighborhoods has more than doubled. But here's the real news. Over the same period, the pace of gentrification in Philadelphia’s low income census tracts increased by a staggering factor of 1,800 percent. That’s correct. 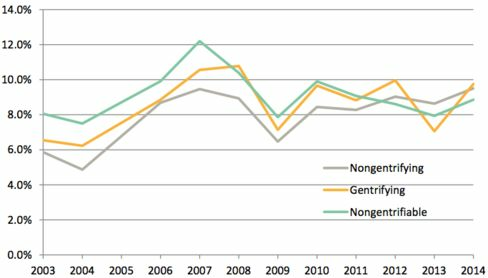 According to this study, Philly's gentrification rate is 18 times what it was in the 1990s. Just one city tops Philly's rate: San Diego (with a 2,015 percent increase). Now, to be clear, other cities are obviously more gentrified than Philadelphia. A whopping 58 percent of Portland's low income census tracts gentrified between 2000 and 2013, Governing's study found, compared to just 29 percent in Philadelphia (by that metric, Philly ranks 12th nationwide). But apart from San Diego, no city in the nation is seeing gentrification accelerate as much as Philadelphia. 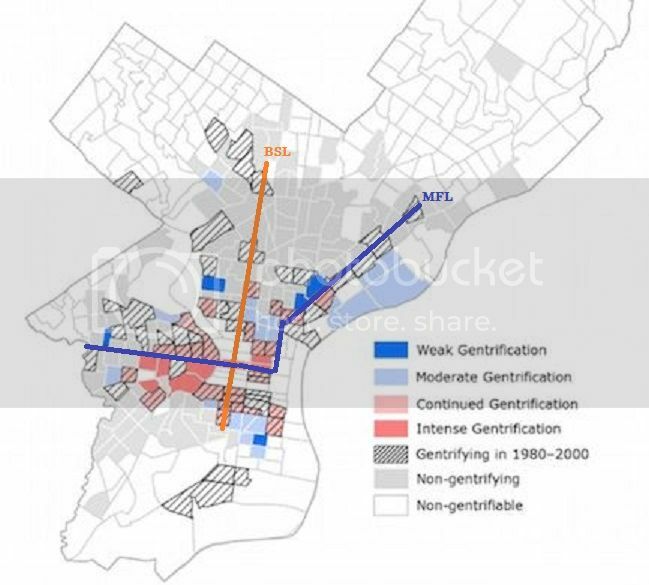 Between 1990 and 2000 only four low-income Philly census tracts were deemed to be gentrifying by the Governing study. Since 2000, though, 84 tracts have begun gentrifying. Put another way: between 1990 and 2000, just 1.5 percent of the city's poor neighborhoods were gentrifying. Since 2000, 28.7 percent of those neighborhoods are gentrifying. Do the math: it's an 1,813 percent jump. 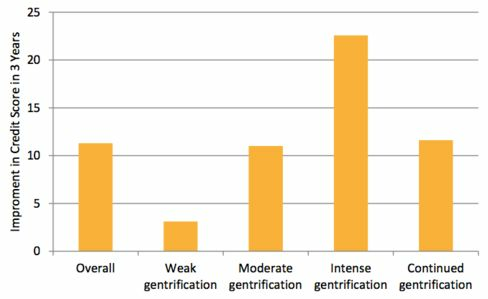 The study found that the rate of gentrification is most intense around Center City and the neighborhoods surrounding University of Pennsylvania and Temple University, City Lab reports. The homes in these areas are valued at $238,049; in weakly gentrifying areas the median home value is $70,316. A rendering of the reopened North Concourse, lined with retail - just like a walkable city should have ! 1. 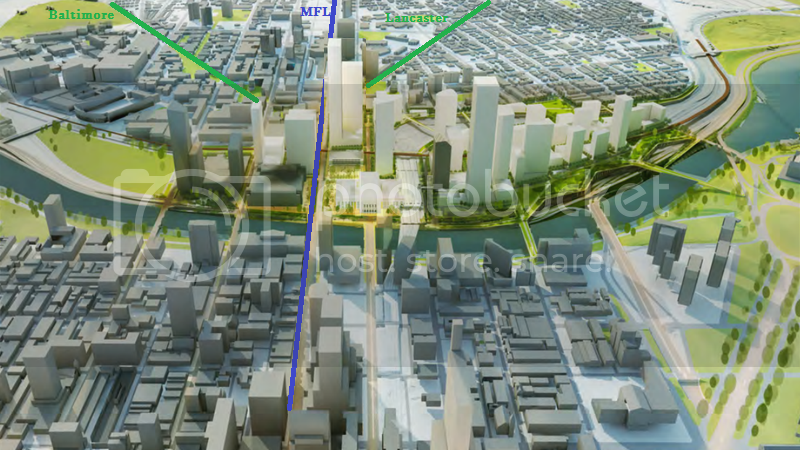 Improvements to 30th Street Station will likely happen first. In a effort to increase accessibility to the train station, the plan proposes a number of upgrades: Access on all four sides of the building and reopening the North Concourse to increase platform access to Amtrak by 50 percent. The report says these improvements should be "achievable in the near term." 3. Commuters won't have to go outside to transfer to SEPTA. In the new proposal, commuters transferring to SEPTA from Amtrak will be able to reach the subway or trolley via a new stairway in the Main Hall of 30th St. Station. The concourse will have a massive skylight and retail. SEPTA's capital budget for the coming fiscal year includes money for more accurate travel information, improved stations, and more than 500 new buses, all part of a long-term plan to update a system that for years went without needed upgrades. The $548.63 million capital budget for fiscal year 2017, which begins July 1, was made public Friday and is about $14 million more than FY 2016's capital budget. It is part of a $7.3 billion, 12-year capital program. SEPTA's overall budget for the coming year is about $1.4 billion. New vehicles are the single biggest capital expense this year, with $168 million set aside. A portion of that is for purchases from recent years, including $15.5 million toward 13 electric locomotives. But the budget includes $60 million for 525 new 40-foot buses expected to be delivered between 2017 and 2021 at a total cost of $415 million. Another expense new in the coming fiscal year is $48.6 million to lease Amtrak-controlled rail. Seven of the 13 Regional Rail lines run on Amtrak's rail, and this year federal law boosted the cost of leasing that track on the Northeast Corridor. -24k to 631k in March - the lowest since Oct. 2007. "Frinally getting back to a clean slate"
Banks (like Wells Fargo) are now cutting the numbers in their foreclosure units. Overall, residents do leave gentrifying areas at "slightly" higher rates than areas that aren't changing, but researchers found it's people with higher credit scores who are more likely to leave—a kind of "up and out" move to suburbs or wealthier parts of the city. Residents with poor credit scores tend to leave gentrifying neighborhoods at roughly the same rate as those who live in other low-income areas that aren't gentrifying—that's why the orange and gray lines below are generally close together. Residents who are able to stay in the neighborhood see their credit scores increase, particularly in areas that are changing rapidly. That's a sign that gentrification can help the financial well-being of people who stay. But among those who do leave, the effects can be disproportionate. "Vulnerable residents who are not able to remain in the neighborhood … face a higher risk of moving to a neighborhood that is worse off," the researchers write. This is particularly true for renters. They're also more likely to move to neighborhoods that are predominantly non-Hispanic black, which suggests that gentrification could reinforce economic and racial disparities. Although poor people may not be forced out, the demographics of gentrifying neighborhoods still change because those who move in are more well-to-do. Those new residents are, on average, 1.3 years younger than the people who left the area, are more likely to be white, and have credits scores that are an average of 5 points higher. Philadelphia has a few unique attributes. Poor neighborhoods in the city tend to have many vacant lots, so they can gentrify by developing new buildings on empty lots, which could reduce how many people are displaced. The patterns generally fit with some studies in other cities—research in New York has found that residents can benefit from staying in gentrifying areas. "More business opportunities and access to credit might be one reason why residents saw their financial scores improve. But it’s also possible that residents who stayed in these neighborhoods had more of a financial safety net to begin with." A historic high school in West Philadelphia will be converted into an apartment building, according to multiple reports. It was announced on Friday that a Brooklyn-based developer, Heights Advisors, had acquired $24 million to redevelop the four-story West Philadelphia High School into 268 apartment units. Located on 4700 Walnut Street, the late Gothic revival high school was built in 1912 and shuttered in 2011. Students moved to another, newer building a few blocks away, while the former school, which is listed on the National Register of Historic Places, sat abandoned for years. The construction loan was a long time coming, since this will be the developers' first project in Philadelphia. According to the Height Advisors website, the rehabilitation project on the 442,200-square-foot building won't begin until 2017. Brooklyn-based Heights Advisors describes the project at 4700 Walnut St. on its website as a gut rehabilitation. An entity with the same address as Heights Advisors purchased the 1911 building for $5.1 million in February 2015, according to records filed with the city. February 5, 2016 [Philadelphia, PA] – Colliers International Capital Markets (CICM), a leading provider of commercial real estate finance and capital markets expertise, arranged $24 million of debt for the acquisition and redevelopment of the former West Philadelphia High School located at 4700 Walnut Street. The 442,200-square-foot, four story building will be converted to a 298 unit multifamily property. Kristopher Wood and John Banas, both Senior Vice Presidents/Directors in CICM’s Philadelphia office, arranged the loan. “The borrower wanted to purchase and reposition the former school located in West Philadelphia near University City,” says Wood. “Getting a construction loan was challenging because this was the first development the New York developer had done in Philadelphia, and many thought the location was not ready for 298 new apartments. CICM sourced a loan from a national Real Estate lender who took the time to understand what was happening in University City and what a great opportunity such a large building afforded the developer to build.” Wood added. “Many apartment operators are capitalizing on quality assets that present opportunities for adaptive reuse of older assets into great apartment buildings,” adds Banas. The three year adjustable loan is interest only at Libor plus 3.75% and was done as a Section 47 Historic Tax Credit deal. The downtown market had a solid performance in 2015 despite a few bumps. While the vacancy rate was at its lowest level in fifteen years, absorption for the fourth quarter dipped after three strong quarters. This was mainly due to Bank of New York Mellon’s contraction from six floors at 1735 Market Street. However, the conversion of a portion of One Franklin Tower to apartments, and the deferment of the balance of the office space for retrofit, removed over a half-million square feet of vacancy. There will be additional spaces vacated in 2016 by Dow, Cigna and FMC, and 200,000-square-feet of renovated space at One Franklin that will be available in Q3.However, it is likely that a portion of these vacancies will be leased. Demand for loft-style offices is influencing the retrofit and conversion of traditional office space. The vacancy in Philadelphia County increased from 7.3 percent to 8.5 percent during the last two quarters of 2015. SuperFresh and Pathmark store closings were added to Bottom Dollar vacancies from earlier in 2015. 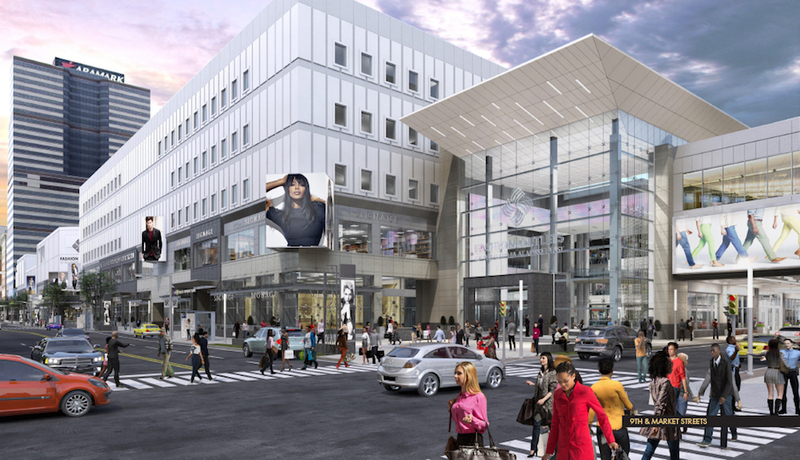 The Gallery is currently out of the active inventory as PREIT and Macerich have commenced on the two year redevelopment project into the Fashion Outlets of Philadelphia. 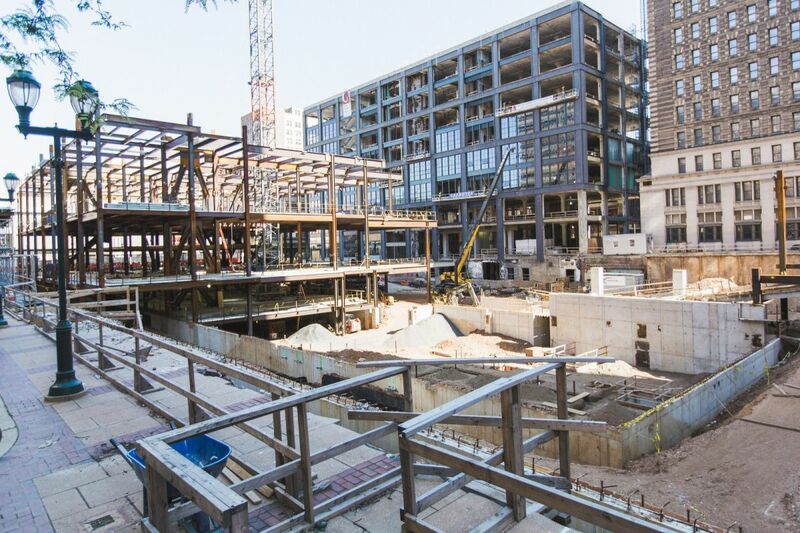 The expansion of the retail footprint and strong retailer demand in Center City shows no signs of slowing. ...with more than 100,000 millennials having entered the market since 2006. The industry's also seeing continued support through local government incentive-based programs. However, the market also has some challenges to overcome before it can reach its full potential. Venture capital investment remains low in this first-generation tech market, keeping many companies in the startup phase. Additional seed capital and angel investor activity will likely be needed to grow the current crop of tech companies. If I were to invest in USA -- and I won't be -- I would only invest in the southern states as they have the highest population growth. as Europe in the long term. I don't believe the rich south is going to finance/subsidize the lifestyle of the "poor north". growth rate of yields, and dividends, and wages and so on.
" I would only invest in the southern states as they have the highest population growth. America's caucasian demographics are as bad as Germany. USA as the only developed country has the advantage of an influx of Latino's"
That "advantage" of the Southern States could disappear quickly, if Trump becomes president. I wonder if his first 30 days will be as productive as the first 30 days of Duterte? and that indicates that income is declining rapidly.... So how in the world can you expect rent to rise and jobs to be there. repatriates all illegal immigrants, it will be enough to cause a depression in USA. So that s all that I can tell you. Do yourself a favor. Sell and run for your life. repatriates all illegal immigrants, it will be enough to cause a depression in USA." Can you explain the logic of that? Going to cause a depression in the US? There are many jobs in these inefficient area, and eliminating them will be painful. The Next Great Depression might actually be a good and needed thing. This city’s never-ending quest to convince millennials that Philly is a great place to live and work may be paying off. A new report reveals that people in this age group are more satisfied with Philadelphia than others. Apartment List just released results from its second annual Renter’s Satisfaction Survey, and found that while millennials gave Philly an A- grade for satisfaction, renters overall gave it a B.
Nothing’s wrong with being a B student. And it’s definitely an upgrade from last year’s survey, in which Philly earned a C-. In this most recent survey, Philly renters said they were extremely satisfied with the city’s access to public transit and parks, giving them an A grades. But to no one’s surprise, it’s the big fat "F" renters gave Philly’s quality of schools that brought the city’s overall grade down to B. They also weren’t too satisfied with the city’s safety. Can a diverse downtown remain inclusive even as rents rise and developers cater to a more affluent clientele? Wallace Wyche is tending shop in a ghost town. The three-block-long shopping mall where he works in the heart of Philadelphia is empty, cleared out for a massive renovation. At one end, where his Verizon store is situated, a few stragglers hang on: a leather goods shop, a perfume shop, a GameStop. A lone police officer sits at a security station, clearly bored out of his mind, and looks over the empty expanse. There used to be two cops stationed here, but the second was taken off the desk. The scene is a far cry from the mall where Wyche first began working. Then, The Gallery at Market East, known as “The Gallery,” was bustling with people, many of them black and coming from neighborhoods that didn’t have a lot of safe places to meet a friend, pick up new shoes or grab a bite to eat. For the past 15 years at least, The Gallery has been what Elijah Anderson, a Yale professor of sociology, calls “a black place,” attracting a majority African-American clientele from the city’s disinvested North and West sections — both a mere subway or trolley ride away. But last year, the owners of the mall, Pennsylvania Real Estate Investment Trust (PREIT), began to reinvent the mall for a new clientele. Now riot screens cover the tunnels connecting the mall’s subterranean eastern and western halves. The crowds have vanished, along with the numerous shops frequented by black shoppers, like Horizon Books, one of the last African-American bookstores in the city. New mixed-use towers that will include offices and luxury apartment are under construction on the blocks surrounding The Gallery. Today, Center City Philadelphia is the second most populous downtown in the country, a dense, transit-friendly hub where a good meal and plenty of shopping options, from posh Barneys New York to cheap-chic Buffalo Exchange, can be found on foot. For the first time in generations, people are moving downtown, to luxury apartments and condos being created above and alongside fancy restaurants and chain retailers that are no longer afraid of the city. On Market Street east of City Hall, a prime stretch connecting the city’s business center to Independence Mall and other tourist attractions in Old City, it isn’t only The Gallery (now the Fashion Outlets of Philadelphia) that is getting a facelift. There are at least two other major mixed-use projects underway, and many smaller developments, which promise to add thousands of new apartments and hundreds of thousands of square feet in new commercial space. 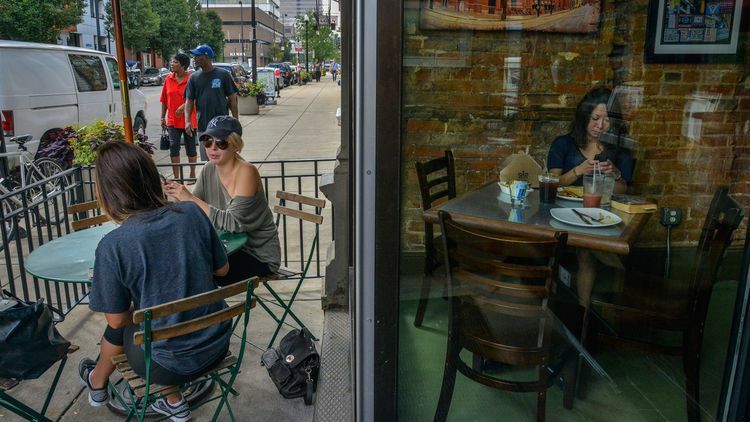 Even before those projects are complete, the population of what the Center City District terms “Greater Center City” had, at last count, grown by 17 percent (since 2000), largely driven by an influx of childless millennials and empty nesters. But outside of Center City and its halo of revitalizing neighborhoods, Philadelphia still struggles with crushing poverty — more than a quarter of the city’s population lives under the poverty line — and middle-class flight. Although the unemployment rate in 2015 fell to 7 percent, there are still many parts of North and West Philadelphia where it is more than twice that. A 2015 Pew analysis found that in a ranking of comparable cities, only Detroit has a larger share of its population outside of the labor force. And while some centrally located areas are gentrifying, many outlying middle-class neighborhoods have seen median incomes drop precipitously. And while PREIT is keeping quiet about which retailers it is courting for the revamped space, the company clearly hopes to shed the mall’s discount store vibe. Renderings show a brightly lit, glass-fronted structure with sit-down restaurants and shops facing out to the street. In an emailed statement, PREIT spokesperson Ashlyn Delson describes the new offerings as “a fusion of outlet retail including designer and moderate brands, popular flagship retail, artisanal food experiences and entertainment offerings.” She calls it “the future of outlet retailing.” Still, the first new tenant PREIT has welcomed is a Century 21, a discount retailer of designer clothing. But as Center City continues to grow and neighborhoods on the city’s fringe continue to stagnate, it is worth asking whether the mall can remain a diverse hub for all Philadelphians now that its lower-end corners are being upgraded. It isn’t only The Gallery, after all, that is moving upmarket. Chinatown is being transformed by an influx of wealthy single professionals (many of them Chinese), while the area known as the Gayborhood has shed all the trappings of its past as an affordable — if seedy — respite for the young and queer and now boasts a nationally renowned concentration of high-end restaurants. Earlier this year, the central Love Park closed for a complete rehabilitation that will transform the austere modernist plaza — which attracted a steady stream of skateboarders, many from lower-income neighborhoods — into a greener and more tourist-friendly site. The old Dilworth Plaza outside City Hall is long gone too. Once a grimy warren of bizarre little alcoves, which sheltered Occupy Philly and a year-round homeless population, it is now a sleek, well-secured monument to the new Center City, all fountains and open space where encampments once stood. Changes of this nature are probably inevitable. A booming downtown will not long cede swaths of prime real estate to uses that predominantly attract low-income people. But we shouldn’t pretend that nothing has been lost in the transformation of these spaces or that the people who frequented the old Gallery or Love Park will necessarily be back. PREIT’s plans promise to reconnect the shopping center with the rest of Market Street. In 2014, the real estate company brought in Macerich, the third-largest publicly traded mall company in America, which now has a 50 percent interest in The Gallery. Construction is estimated to take at least two years, and completion is expected in late 2018 or early 2019. Woodard has mixed feelings about the project, which he views as a necessary auxiliary to the Pennsylvania Convention Center and the luxury hotels that have sprouted near City Hall. Although he loved The Gallery as it was, he also recognizes that it proved a challenge. Its stores did not appeal to conventioneers and tourists, and the closest shopping destinations were around Rittenhouse Square, a mile away from the convention center. It didn’t compare to the outlet offerings that similarly prominent cities like Atlanta or Boston have in their city centers to capture tourist dollars. The population that could be served in the immediate vicinity had changed radically as well. In 1980 there were only 2,768 people per square mile in the census tract that contains The Gallery. By 2000, there were 6,762. At last count, the number had more than doubled to 14,424 with similar patterns in most of the surrounding tracts. Macerich (MAK) ... All : 5-yrs : 2yrs : 6-mos , the third-largest publicly traded mall company in America, has a 50% interest in The Gallery. Construction is estimated to (cost over $1 billion, and) take at least two years, and completion is expected in late 2018 or early 2019.